Friends, Fashion, Fun, and Music! Must Be in ATX! This past Saturday I went to the Art & Fashion On First event in Austin, Texas. 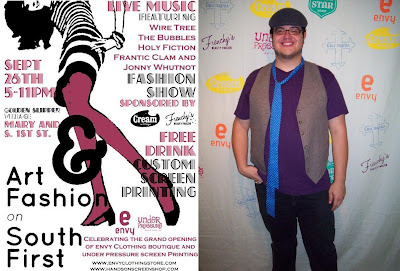 The event was celebrating the grand opening of Under Pressure Screen Printing Shop and Evny Clothing Boutique. There was music, food, friends, shopping, and so much more. My favorite part of the night was when the fashion show happened. One of my best friends, Julia Ferguson, worked the runway and was beyond fierce. Julia is fresh off of the runways of Austin Fashion Week where she modeled for Project Runway's Kayne during the Austin Fashion Awards. She was born to model and was totally giving it to the crowd on the runway! Above: Julia Ferguson shows the crowd her fab frock and does a little turn on the catwalk. I was loving the hair by Frenchie's Beauty Parlor. They captured the personality of each model perfectly. Everyone involved in the show seemed to have a great time, including one model who gave me one of my favorite shots of the night. The event was put together by the wonderfully talented Mairin Heard who did a sensational job! Congrats Boo! The event was fantastic and the turnout was amazing! Above: Mairin Heard, Jonathan Valdez, and Julia Ferguson pause for a photo op! Looks like you guys had a good time. Wish I could have come. It was a lot of fun! Come out more! I know she is so good! Oooh fun! That is wayyy cool!